Disgraced former Rutherford County Sheriff Robert Arnold is serving time in a so-called "Club Fed," but he may soon be a free man. 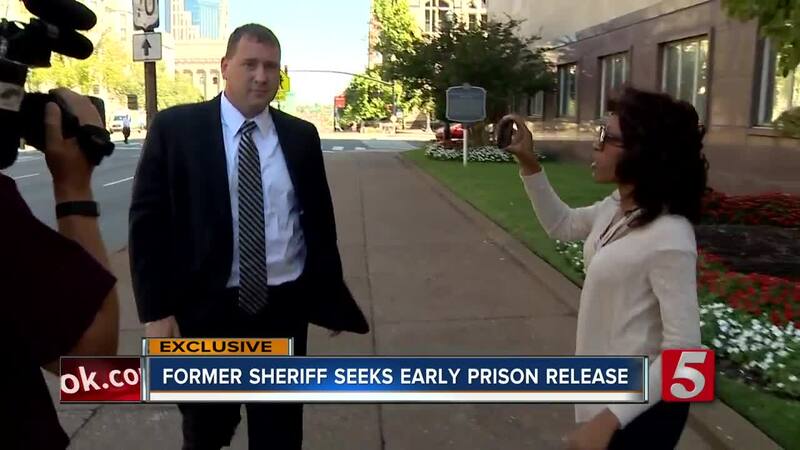 NASHVILLE, Tenn. (WTVF) — Disgraced former Rutherford County Sheriff Robert Arnold is serving time in a so-called "Club Fed," but he may soon be a free man. By most accounts he's been a model prisoner, and the convicted felon may get out a year early. It was only last year that Robert Arnold sought a pardon from President Trump. That is not why it appears he'll be getting out of prison early. There's no indication the President even considered the request. Arnold had contacted the White House wanting an executive grant of clemency for a full and unconditional pardon. It would have wiped his slate clean. At the time, Arnold said that was he unfairly locked up. "This is all politics. I'm a political prisoner," said Arnold in a phone interview. But he had pleaded guilty to wire fraud and extortion linked to the illegal sale of electronic cigarettes in the Rutherford County Jail. He was sentenced to four-years in the federal prison camp near the Maxwill Air Force Base in Montgomery, Alabama. With landscaping and groomed lawns the so-called "Club Fed" once ranked as the third cushiest in the country. Still, Arnold hoped for an early release. "I think it's an extreme longshot. The percentage is probably less that one percent," said legal analyst Jim Todd and he was right. The pardon did not happen, but now sources tell NewsChannel 5 Arnold can begin paperwork for an early release based on his good behavior. Under the sentencing guidelines, Arnold can be released a year early: First six months in a halfway house; then house arrest for the final half year. That request must be approved by the feds. "It would get him out of prison early, but it doesn't necessarily restore his civil rights or expunge your record," said Todd. Arnold is now a convicted felon. He plans to return to Tennessee. His plans beyond that are unclear, but his career in law enforcement is over. Barring any new developments, Arnold could be released to a halfway house in middle Tennessee by this May.